While playing poker, the card players need to be alert to make a note of all the moves and play accordingly to the rules. It is vitally important in blackjack card-counting and online baccarat and in poker games it is of highest importance. It is important to have the record of the money that you have won and the estimate of the money that is expected to be won. For this purpose the concept of the implied odds came into the existence. It is basically needed to know the expected money that the player can win after withdrawing the hand. Implied odds are the money that you can get from your opponent after you have put the money into the pot while making the call. The implied odds do not require any kinds of the calculations but are very important. The main reason behind this is that when player performs the calculations for the pot odds, then the money that is calculated is the only money that is at present there in the pot, and it has no relation with the money that the player can win in the future bets. Once you understand the theory of the implied odds, it would be easy for you to make better move as then you will know better when to call a hand and when to fold it. This will surely help you to make more money by catching up the right cards every time and you will get more than what there is present in the pot. Once you gain experience with the implied odds then there is no need to follow the rules of the pot and you can make most of your money. However if you are bad at implied odds then you need to follow the pot rules if you want to save yourself from losing the money. This concept of the implied odds is used almost in kinds of the Poker games but these days it is used widely in the game of the Texas Hold'em. It generally advised to hide your hand if you want to make most from the implied odds. This is because if your hands will remain hidden, then the opponent is not going to suspect you and you will have much higher implied odds. Generally straights and the sets are hands that are considered to be the good implied odds because most of the time they remain hidden and as a result they are overlooked by the opponents and therefore bring in the large amounts of the money. However the hands like the flushes are considered to be the bad implied odds. The main reason behind this is that as soon as the player gets the 3 cards with the same suit, he becomes wary and therefore the chances of getting paid off then becomes more and more slimmer. 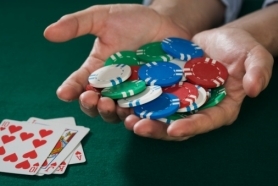 It’s better to remember the thumb rule of the game that if the opponent is ready to give you the credit on having the strong hand then you have very good chances of extracting out more money from him. Since there are no calculations involved with the implied odds, so your experience counts here to make an estimate of the total amount of the money that you can win. If you follow the thumb rules and perform some rough calculations your chances of winning the games are surely going to increase more. You have to apply the concept of the implied odds after making the draw so that you can decide which move either the call or the fold is going to fetch you more money. Pot odds are generally used while making the decision regarding the draws and after that the implied odds help you. They generally act like the add-ons to your decisions so that you can make the best move. It’s better to have the knowledge of the pot odds first before directly jumping over to the implied odds. If you can do well in the pot odds then you have very good chances that you will do well with the implied odds also. You can easily have the overview of the implied odds once you are over with the pot odds because the chances of error with the pot odds are very rare.